Add dazzling detail and eye-catching special effects to any watercolor painting or paper crafting project with a dash of ready-to-use Liquid Metal. 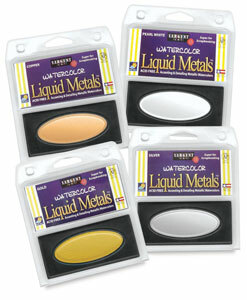 These watercolor pans offer rich, vibrant metallic color. Each is individually packaged in a durable and reusable clear plastic clamshell 7.5 g container.